Trusty and I have some VIPs coming to town next week, and to adequately prepare for their visit we’ve been doing some lobster roll “research.” Our attempt to share the best lobster roll in NYC with our out-of-town gourmets led us to Grand Central Oyster Bar in Grand Central Station and Luke’s Lobster Shack’s new location on the Upper West Side. 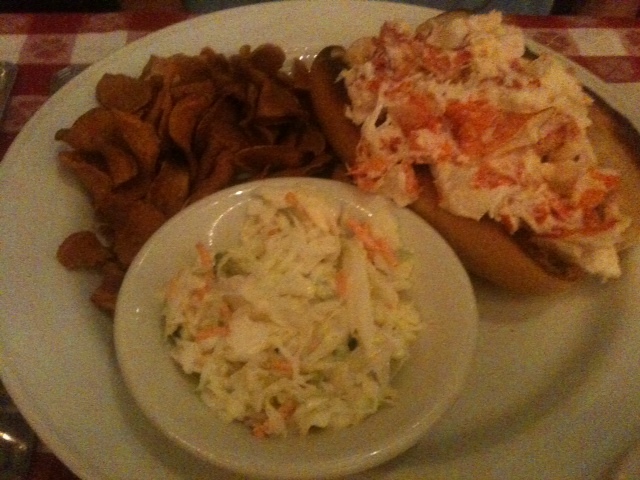 For $24 this lunch includes a giant lobster roll with two sides of sweet potato chips and coleslaw. If you’re a fan of the old school lobster roll (this approach tends to favor shredded lobster meat instead of big hunks, the lobster salad pays homage to Helman’s Classic Mayo, and it’s served room temp rather than chilled) than this is the roll for you. The price is a little steep, but the serving size is generous (Trusty and I attempted to split it and still had left overs) and, what you’re paying for in part is the atmosphere. With it’s red and white checked table cloths, vaulted tile ceiling, dim lighting and no-nonsense wait staff, the dining room feels as though it’s frozen in the 1960’s. But it’s actually filled with the hustle and bustle of Grand Central terminal–you’ll see business men and women indulging in a cocktail at lunch, some tourists taking a break from being on their feet, and, appropriately, some old school New Yorkers who look like they dine there everyday. So, bring your wallet and your appetite and expect to enjoy a creamy, delicious roll as well as some excellent people-watching. Our next stop was Luke’s Lobster on 426 Amsterdam (between 80th and 81st). Luke’s serves their rolls Maine style, which is chilled with a swipe of mayo, a sprinkle of lemon butter, and a dash of seasoned salt (though you can order your roll without any of these, if you want). The other major characteristic of the roll is that it features large, meaty hunks of lobster, rather than a shredded lobster salad. Trusty and I agreed we preferred this approach, but I understand that this is a matter of personal preference. I didn’t really go for the seasoned salt–for me, a good lobster roll is all about the lobster, and when it’s nice and fresh it has its own succulent flavor and sweetness that had to fight against the savory and salty seasoning to come through. 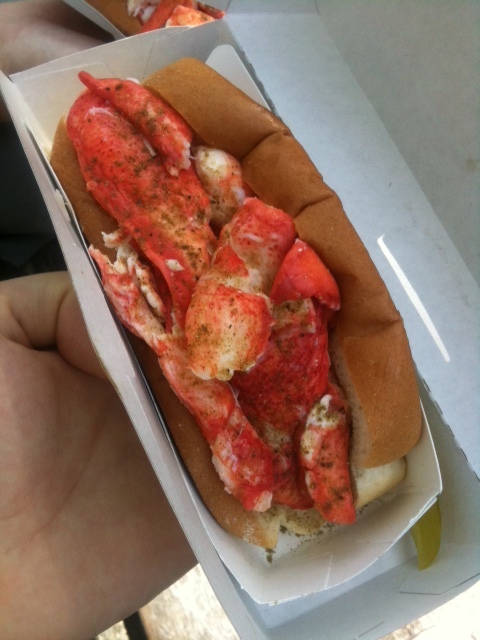 However, Luke’s scored big points for chilling their lobster meat–not only does this help lock in the flavor of the meat, but it provides for a great contrast between the chilled lobster and the toasted bun. The other competitive advantage for Luke’s was their price; for $15 their roll was just as filling and much more affordable. So what’s the verdict on the Best Lobster Roll in New York City? So far Luke’s and Red Hook’s lobster rolls are in the lead, but stay tuned as we complete our “research”–after all, this kind of project requires a thorough approach!